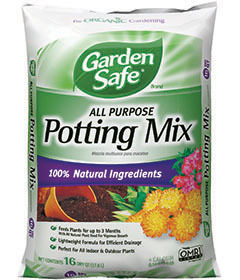 16 quart Garden Safe All-Purpose Potting Mix is an organic and natural plant food for vigorous and beautiful plant growth. It is perfect for indoor and outdoor plants, flowers, tropicals, herbs, vegetables, seedlings, containers and hanging baskets. It can be used straight from the bag or can be cultivated into garden soil to help create a nutrient-rich feeding ground. It provides slow-release plant food that lasts up to 3 months.